See Cannon Street as it could be - a place the community can be proud of. At today's General Issues Committee meeting, Hamilton City Councillors will hear a delegation from Yes We Cannon presenting them with the opinions and signatures from over 2,300 Hamilton citizens. 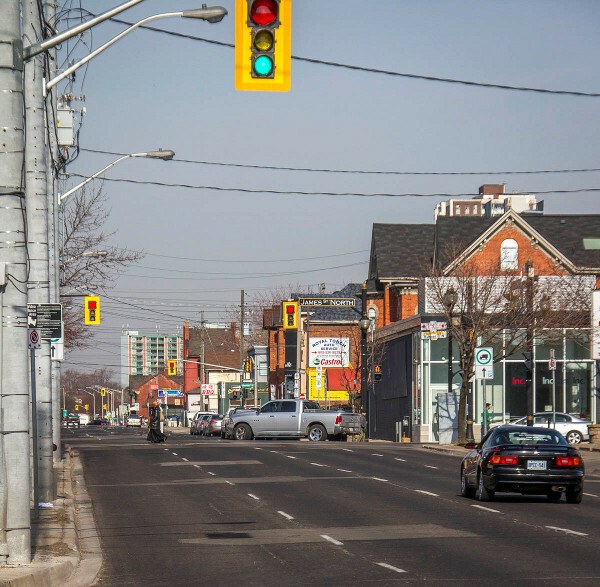 The vision for Cannon Street we're putting forward is one where Cannon street changes from being simply a piece of infrastructure that serves to move vehicles at high speeds through our neighbourhoods to one that connects them. We envision a street that is a part of the community, where city life can play out, where residents are comfortable letting their children walk down the sidewalks, and where all road users can move safely and effectively from where they are to where they need to go. We've been getting a lot of feedback from Hamilton residents, and almost all of it has been positive. We also feel that a picture is worth a thousand words, so we're happy to share these visioning images with all Hamilton residents. 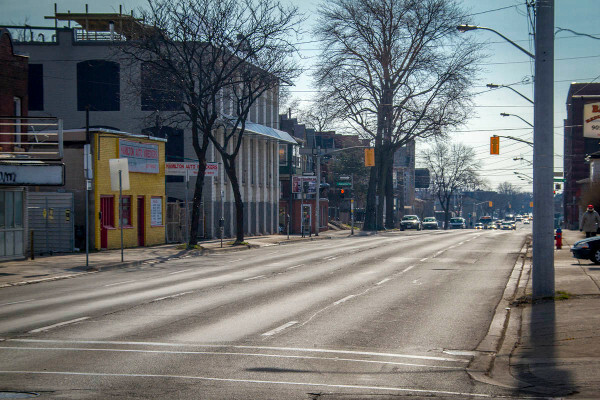 Here you see Cannon street as it is now - an expanse of concrete that carries very low traffic volumes compared to other Hamilton streets at high speeds through lights that are times to keep them moving quickly. And here we see Cannon as it could be - a place the community can be proud of. Cannon could be a showpiece to highlight our city's commitment to active transportation to the thousands of visitors that will flow into our city for the Pan Am games in less than two years, a safe space for children and parents to ride to school, work, the grocery store or their neighbour's house, a welcoming place for residents and tourists alike to ride Hamilton's shiny new bike share bikes (when they arrive), and a safe, effective active transportation corridor through the lower city. The bidirectional, segregated cycling facility proposed here is the best and safest option for drivers, pedestrians and cyclists, and it also works regardless of whether Cannon remains a one-way street (hopefully with parking time restrictions removed on the north side, providing additional protection for pedestrians) or goes to a two-way street. As it is now, Cannon is not a welcoming street - it's a place where you aren't made to feel welcome unless you're behind the wheel of a car or a truck. As we see it, Cannon street gains greenery with planters segregating the bike lanes from vehicular traffic, gains protection for pedestrians on the sidewalks and becomes a much more walkable, livable street. We know which vision for the street we'd choose - and we hope that council makes the same choice. Big thanks to Jeremy Johnston for creating these renderings. You can watch a livestream of today's GIC meeting courtesy of Joey Coleman. I'll note in passing that Cannon Street is currently so dismal and human-unfriendly that the organizers actually had to Photoshop pedestrians into their "after" renderings. One question to the author; which direction should the outside (closer to traffic) bike lane be heading? Is it with traffic, or against? I have no idea, but I'd think that against might be safer because you could see oncoming traffic. Cyclists always ride on their right, just like a car would. It's a good point, but it could create confusion if you're asking cyclists to ride on the wrong side. Gotcha! Thanks for clearing that up, Justin. One thing I'm still confused about is cyclist light phasing and safety. 1) Inconvenience cyclists and have a specific phase where only cyclists can move through the lights, something that would make it slow to travel through. 2) Inconvenience motorists and only allow left-turns during the beginning/end of each phase which would effectively reduce the one-way throughput of street to one lane, which based on the traffic counts RTH published, would push it near/over vehicle lane capacity. It could be mitigated by restricting parking during peak periods, but then you're creating a hostile pedestrian environment on that side of the road and ticking off business/downtown home owners. 3) Completely restrict left-turns on the street which would make navigating the city even more confusing since Cannon would effectively become a "limited-access" highway. ...in order to enable the restricted left turns though the cars turning left on the side of the street could continue to turn left though it would be incredibly confusing. There's also the issue of allowing space for DARTS vehicles to drop off/pick up along the road stretch. Ottawa had this issue with their protected lanes on Laurier, though they resolved it by removing protectors and allowing the vehicles to block cycling lanes. 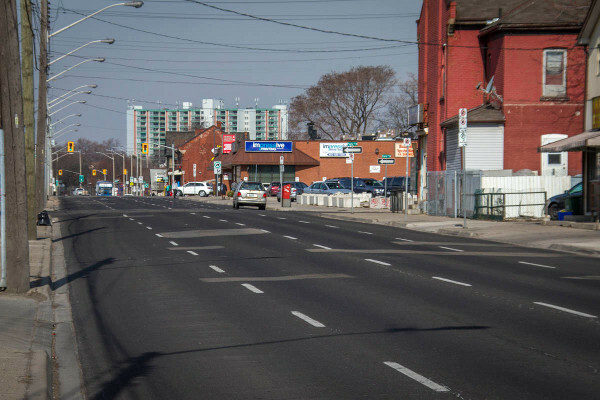 To me, a Laurier Avenue type set-up in Ottawa would be better with a protected , though businesses and residents would never be on board with loss of parking. I'd be intrigued to know how Yes We Cannon would resolve this. 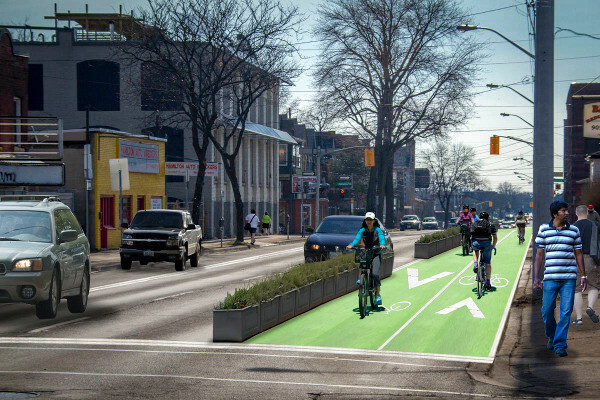 That all said, I like the idea of bike lanes/cycle track on Cannon. There seem to be many more opportunities for uninterrupted protected lanes between Wellington and Sherman, possibly because commercial/industrial uses are concentrated closer to the core. Of the 18 south-sited blocks between Wellington and Sherman, two thirds feature one or fewer access points (alleys, driveways, parking lots) and half of those appear to feature no functional curb cuts. West of Wellington, the only unbroken stretch of Cannon seems to be Ferguson to Elgin. Bay to Caroline to Hess and Elgin to Mary feature a single access point, Mary to Catharine features two access drives and every southern block of Cannon from Catharine to Bay has 3-4 access points. Any protection would be welcome, though, since to judge from traffic volume figures, this stretch of Cannon boasts the highest number of vehicles along Cannon. Guessing there might be courtesy cut-outs in the barrier for DARTS or cab off-loading, as well as garbage/recycling pickup. one of the advantages of keeping Cannon a one-way street is so that there is no need to allow drop-off or pick-up vehicles to use the bike lanes. With 2 traffic lanes heading the same direction, a garbage truck can do their thing from the live lane just like they would on Garth or Main/King east of the Delta. Having 2 westbound travel lanes on Cannon means cars can easily go around the garbage trucks or DARTS vehicles. Not to be totally nit-picky, but I'd like to see trees planted regularly in these planters since Cannon is so dull and grey. Eventually once this becomes a permanent project, we can plant trees in the portion of sidewalk closest to the curb. There is room for street trees on both sides of Cannon in it's entirety. Link up to Hess St school and Sir John A.
Connect to Hess which is a safe cycling route through downtown and north through Central Park. Would keep cars in the 'through lanes' and thus cut down on the drastic number of crashes that occur when drivers suddenly realize that their lane is actually a turning lane onto Queen and try to veer over at the last second. 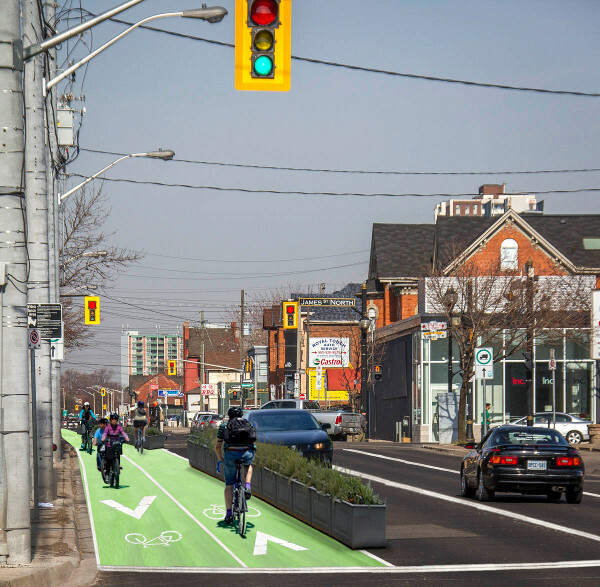 Eventually when the York lanes extend into the core, a bike box can be installed on Cannon at Hess and allow cyclists to shift to the north curb of York to continue. On the eastbound lanes of York a bike box can be added to allow cyclists to jump north to the eastbound Cannon lane if they choose. Hess already has a massive painted 'dead zone' on it's eastern curb between Cannon and York that would be perfect for a 2-way bike lane connecting these lanes. End the parking lane as it approaches intersections and add a left-turn lane, just like we do on two-way streets. Boom, done. Now you can have separate traffic signals for left-turns/cyclists. Cannon Street bike lanes motion passes unanimously on a standing recorded vote. I look forward to seeing the euphoria of success get doused by the hard reality of council backpedalling when they start getting grumpy commuters and "local businesses" (trucking companies) complaining about the impending bike lane. How many times did they vote to approve the West Harbour stadium? This was on top of the Spec website this afternoon, and the two comments so far are scathing against this concept. One of those individuals said we have ruined many other city streets with bike lanes and sidewalks. The loudmouths are already out asking why someone won't please think of the cars. Not some commie conspiracy to take away everyones cars? One complaint. I live north of Cannon so I would have to cross over to use lanes cutting into my effecency time. Also, will scooters be allowed to use these lanes? Congratulations to Yes We Cannon. 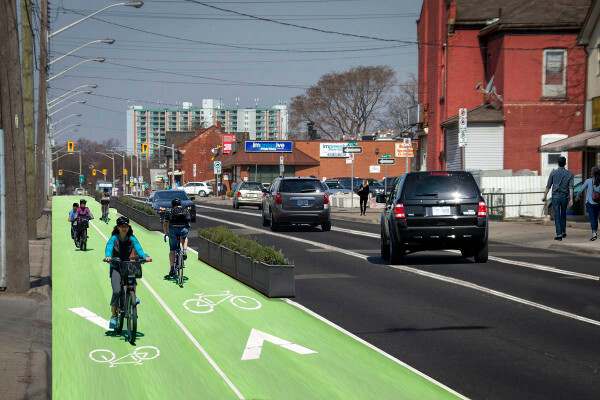 I fervently hope that the effort will remain to extend the bike lanes from Ottawa to Dundurn. As it is, I ride daily across the city, but it isn't worth it to me to take Cannon for such a short distance. I will continue to take my chances on King and Main. Wish me luck. Congrats indeed. I honestly didn't expect this would happen. For those who were at the meeting: I know there was some talk of stopping the lanes at Bay Street - did this ever get decided? Has council committed at going all the way to Queen? Or even past Queen to where Cannon becomes York to Dundurn? Because a bike-lane that ends at Bay would be unfortunate... I mean, without some way to head South on Bay (or a path across the now-defunct Sir John A to Caroline), you basically have a westbound dead-end. Some means to get from Bay to Napier (plus a cultivation of Napier/Head as east-west bike thoroughfares) would make this a coherent route across the city. Further proof we need 2-way Bay. I sincerely want to be happy, but two things stand in the way for now: 1) today's vote doesn't yet mean it will happen--too often Council has backed away from progressive moves after receiving complaints from certain influential/moneyed voices of the status quo, and 2) as ViennaCafe mentions above, this lane, chopped as it already has been before reaching this stage, will likely be much too short for serious cross-city users. And as someone who is on Hamilton's streets by bike every workday, cycling for a living and using bikes for personal transportation, and one who teaches defensive cycling, incl. traffic dynamics, cycling infrastructure that just suddenly ends is often more annoying than none at all. I so wish this city would stop taking good proposals, then chop them up into small disconnected segments. I've spoken to this before. For cycling, or pedestrian infrastructure for that matter, to be useful and successful, it needs to be substantive, coherent and connected to other like infrastructure so as not to leave users suddenly in the lurch (translating to frustration and/or danger, depending on rider knowledge, skill and confidence levels). The proposal was from Sherman to Bay. McHattie moved to amend to go all the way to Queen. Many councilors expressed concern that they hadn't had time to think through the implications of that step--it's a stretch that includes some distinct traffic flow problems--, so the amendment was withdrawn. However, staff were asked to include extension to Queen in their report on the project, so that Council could potentially include it in the implementation. I have to agree. There nothing worse than finally getting up the motivation to dump the car to take your bike and find your bike lane suddenly stops on a mini-freeway. "...cycling infrastructure that just suddenly ends is often more annoying than none at all." Or starts 500m from the Pan Am Stadium, whose events provide the impetus for the lane's construction. A bi-directional bike lane running the full length of Cannon, would be a great asset to inner-city and cross-city cycling infrastructure. Hopefully council will see their way clear to doing just that: The full 6km, not a half-measure. That said, I'd be happy to see Sherman-Bay locked down as an interim measure. 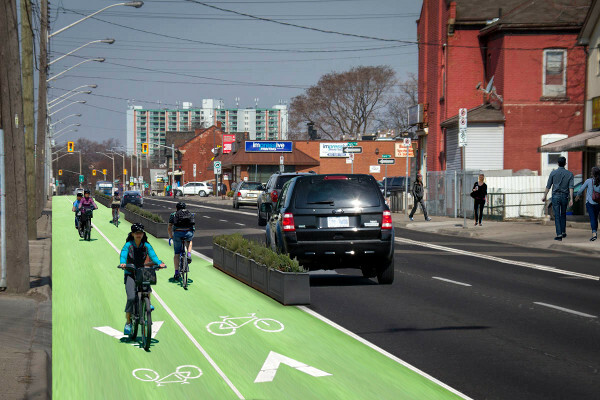 This is a huge move forward for cycling in Hamilton. I didn't get any sense that there might be the possibility of a pullback from this pilot project. This was a great day for cycling. Please dont lose sight of the fact that Council voted UNANIMOUSLY in favour. This is a win win for everyone. It will be safer for pedestrians and cyclists and will have almost zero negative impact on the delay beloved car. What's not to like? So who gets priority at lights- cyclists, motorists or pedestrians? How do you keep the signal timings fair to all modal users without causing unnecessary delays to any? "While Yes We Cannon supporters have called for segregated bike lanes protected by planters, the city motion calls for staff to investigate a range of options including bollards, knock-down sticks or even simple painted lines." Yeah, the problem with going to Queen is evident when you think about all the left-turn slips there. I'm just sad because as wonderful as this project is, it looks like it will still end at a dead end. Basically the best option for folks heading westbound will be to get off and walk the bike the wrong way up Bay to Napier. Not sure why DARTS needs to park in the bike lane to let people off, don't they park in the car lane now to do it? Having parking spots in the bike lane is like closing a whole road as far as bike traffic. If they stop on the street, cars will just go around them, like they already do. Efficiency..as opposed to what? Right now you would...not use Cannon at all, so how is it less efficient? Unless you already ride on Cannon despite the traffic and don't want to use the bike lanes, in which case...you can still ride on the road. Hopefully once they build that it will become clear how good of an idea it is and they will do the rest. How would snow plowing work for the bike lanes? Since the bigger plows will not be able to access the narrower bike lanes, would Cannon also have the small bobcats like they have on Main & King etc to clear the bikelane and sidewalks? And which side would the bobcats push the snow from the bike lane and sidewalk, on a heavy snow fall day? Onto the edge of the sidewalk? or past the concrete boxes onto the driving lane? for pick up by larger trucks and snow blowers as they do on King and Main. Generally most treatments in Australia cost around $40 - $65 per square metre to supply and install, and often there will be further costs such as traffic control. Many local governments which have installed the treatments recently have not yet completed any maintenance. The Sunshine Coast Regional Council estimates that the cost to retrofit worn areas in their region will be within $60,000 – $100,000 over a two year period (Walker 2010). The larger BCC estimated that their current maintenance regime which includes LATM schemes, school zones and bicycle facilities costs $0.75M in the 2009/2010 financial year and has been increasing each year (Lee 2010). PNCC was annually remarking their pavement with coloured surface paint at a cost of $130,000 (NZD) per annum (Morris 2010). However this has been reviewed and a more strategic approach is undertaken, where only areas subject to high traffic are repainted at a cost of $50,000 (NZD) per annum (Morris 2010). I imagine they will use the small bobcats and have some snow head towards the sidewalk and some head into the 2-foot buffer zone between the bike lanes and car lanes. Then, if it's a really big snowfall and some snow ends up in the driving lane, the plows can simply be angled to push everything to the north curb. It would make sense to me to adjust that plan slightly by moving the parking to the north curb and put both bike lanes on the south curb, protected like they will be from Sherman to Queen. Same amount of road space, but will allow a continuation of the 2-way bike lanes on south curb and parking on the north curb. No reason this cross-section can't continue all the way east on Cannon until it's ending near Britannia. I assume that the plan would eventually be to run it the full length of Cannon, as Yes We Cannon advocates. Important to remember that this is a pilot project, and as such the implementation may look very different and much cheaper than the permanent iteration (hence running only half the intended distance and, per the motion, possibly not including nothing more than paint and knockdown sticks -- the pilot formulation used on Main West over the 403 bridge ( http://goo.gl/maps/9JGPj ). You'll notice that the planters are right next to a permanent curb. Let's go for the temporary version of this same idea. The superstitious part of me hopes that council doesn't weigh the price tag of the full-length deluxe version before an implemented version has the chance to change the inner city for the better. Hand councillors a hefty bill at the outset and they may never construct anything more than a shaky rationale for kicking it down the road. The only concern that I have is about the implementation. Will it be properly and professionally done, using the Dutch CROW traffic engineering design standards for cycle infrastructure? Or will it be a crappy, unsafe implementation that few people will use and that will be held up as a poster child for people who hate us to oppose cycle infrastructure? Unfortunately, Hamilton has no shortage of crappy implementations of what would otherwise be great infra. For example, the new Red Bridge over the QEW. Which is great, except that its West end features a lethal trap in the form of an 1)unmarked railway crossing that 2) crosses the path at an angle at 3) a hairpin turn at 4) the bottom of a hill which is 5) not properly cleared of snow and ice in the winter. Putting all five lethal hazard factors together, I do not believe that I could design a more dangerous trap to endanger the public if I set my mind to it. To put these numbers into perspective, our 2013 roads budget is 100 million.